I hope that all of the QQ Mothers out there have had a FABULOUS day full of all the blessings they deserve! Yesterday, as part of My Pink Stamper's National Scrapbook Day celebration, I participated in some of her challenges and created this card with the Quick Quotes Playground line. 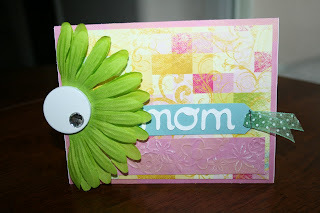 It is not one of the newest releases, but I LOVE the cheery colors and found them to be perfect! You can purchase it all for 20% off this week too! WOO HOO! In honor of this day, I wanted to share with you the MOTHER of Quick Quotes; Patsy. I had the pleasure of meeting her this time last year and we were instant friends. Since then, I've been honored to get to know the rest of the QQ family and cherish them all. 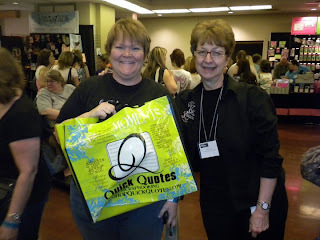 Patsy is devoted to them and the success of their Quick Quotes business. They are all co-owners. She is the face behing all of those FABULOUS quotes QQ is famous for! If you look closely, her name is likely to appear in YOUR documented memories under that saying you love so much. Here she is at a convention, surprising a QQ fan with a tote bag worth over $100 in FREE product. That's what they do if they spot YOU with their gear! Amazing right?! They are truly the most genuine, generous and thoughtful company I have EVER seen, and this is their fearless leader! Now, I promised a winner from our CONTEST yesterday. We are so thankful for the support ALREADY shown and appreciate that all of you have reached out to share the Quick Quotes love with your friends and family. 1 devoted Quick Quotes gal has sent several of her friends over and to her I am thrilled to gift the 'French Quarter' line too. Who is this gal?! Well, it's Debbie Crowder of Kissimee Florida! Debbie, e-mail me your address (brynn@shopquickquotes.com) and I'll have your product to you THIS WEEK! so happy for Debbie. Every line from QQ's is beatiful! Really want to sign up for a reserve weekend! Still talking to the hubby! Congrats Debbie! And Debbie I hope you can talk your hubby into going, the reserve weekends sound fabulous! I really want to go too!